Arena Commander , Star Citizen's multiplayer dogfighting module, took a big step forward today with the release of the v0.9 update. Cloud Imperium Games says it's "the most significant iteration of Arena Commander yet," adding new features, a pair of racing ships, new hangars, and a number of other improvements. The update features a simulation of the famed Murray Cup race, including a new map called New Horizon, and a four-player Vanduul Swarm co-op combat mode. Simplifying the process of assembling pilots for the online action is the new friend code system, while the addition of leaderboards will leave no doubt as to who the top gun really is. 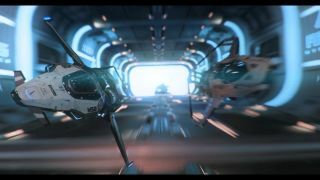 Two new ships have also been added, the Origin M50 and the 350R, and there are now four hangars to choose from. The flight model has been upgraded with six degrees of freedom for all ships, multiple preset control schemes are now available, and the HUD has been upgraded as well. Ships have been made faster, with the afterburners reworked to increase acceleration instead of top speed, and Class One weapon mounts are now fixed forward rather than gimbaled. But wait—there's more! In fact, if you want a proper breakdown you should probably pop over to RobertsSpaceIndustries.com and have a look at the latest Arena Commander transmission. But before you go, enjoy Galactic Gear's review of the M50, a ship that might just have what it takes to win the Murray Cup—It's a bit silly, but a lot of fun, too.